Gardening is one of the best ways to stay in shape, improve your mood, and upgrade your home. All those hours of gardening accumulated help burn a bunch of calories and squatting builds your leg muscles while being in the sun helps you naturally increase your vitamin D. The best part is that it doesn’t have to be expensive either, by using pretty durable items such as cinder blocks, you are able to improve the appearance of your backyard and even grow some of your own veggies. 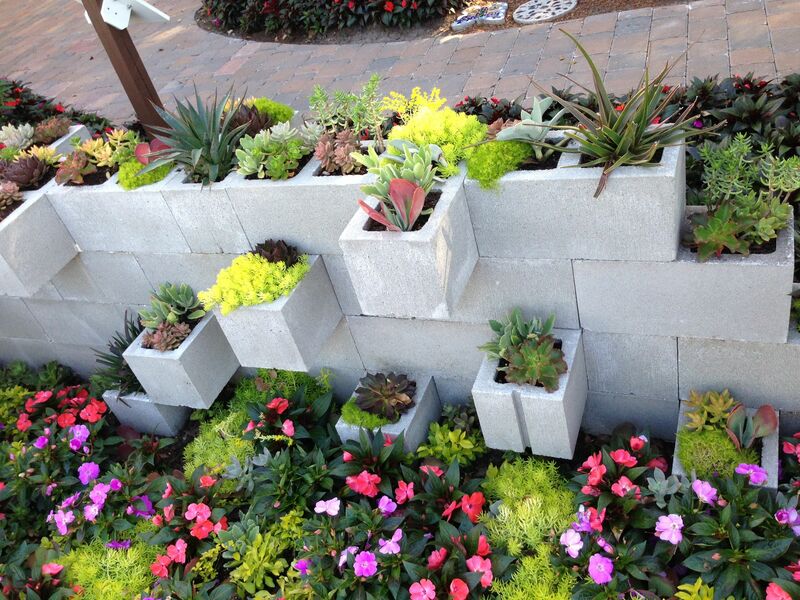 Time to cross groceries off your list and check out these cinder block gardens! Worried about cinder blocks being too boring and gray? No worries, you’re covered. Just add your favorite color of paint and you’ve just created for yourself a super hip and modern planter! If solid colors aren’t your thing, try some patterns out. Just grab yourself a straight edge if you aren’t too experienced with designing and just add some lines in. Even better, grab a stencil from the store for kids’ arts and crafts and you’re good to go. I love how this setup is super compact so if you are short on backyard space just build up instead of out. The subtly in color variation really is what makes this garden so special. 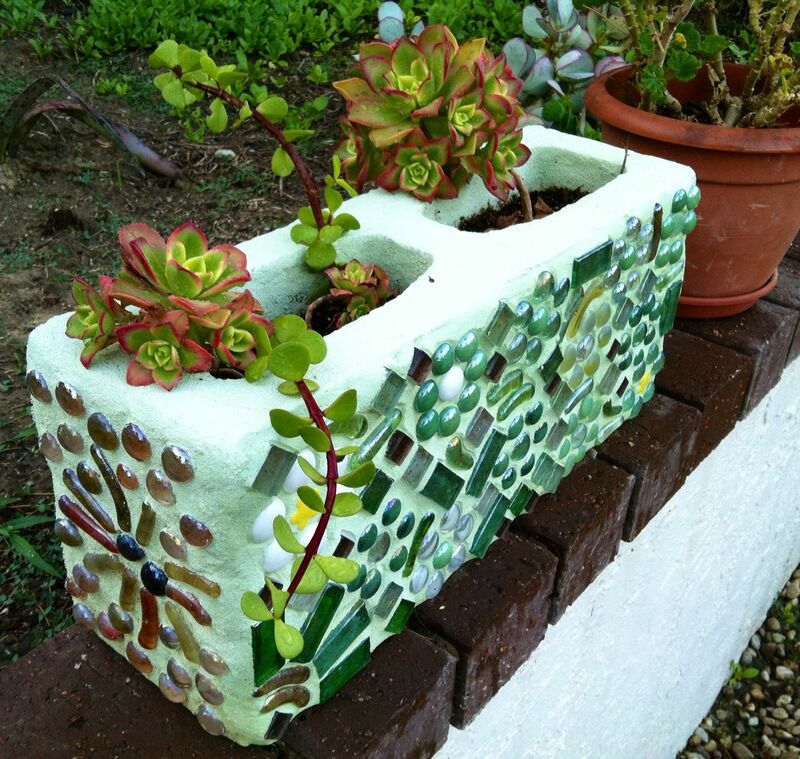 The artwork and attention to detail in this mosaic cinder block pot is just so gorgeous. So if you are a bit more practiced when it comes to working with your hands, this is definitely and good one to try out! You’ll be sure to impress all your guests. While this one looks kind of complicated, when you think about it, it’s quite simple. Just paste on some gorgeous rocks you find on the cheap at the local thrift store or craft shop and you’re good to go! Stained glass and intricate tile work may seem a little old school for some people but it really looks great in the garden to this day! What makes it great is that you can get so many bright and unique pieces to add and not every block has to be identical. If your worried about not having any grass or dirt areas to garden in, you can’t stop now. This is probably one of the easier ways to add green to your backyard without digging up any cement. In fact, you’ll be adding more of it and it’s going to look great! This idea adds a sense of separation between different spaces within the garden. It’s very subtle and functional! Here is a beautifully done staple for every garden. It is created with such amazing function and I can’t wait to try it out when I start on my garden! If you’re looking for a new hobby to get rid of some extra stress that’s been bringing you down, gardening is truly a great option. Having the opportunity to create a healthy relationship caring for another living organism is so rewarding. To make things better, there’s no need to be a millionaire to take on this hobby. So what are we waiting for?